*Article Notes: This monthly column takes some crazy sounding ideas and applies them to the field of Ag Tech. The purpose of this is purely entertainment, but hey, if we can spread ideas, or ignite imaginations, how awesome is that? 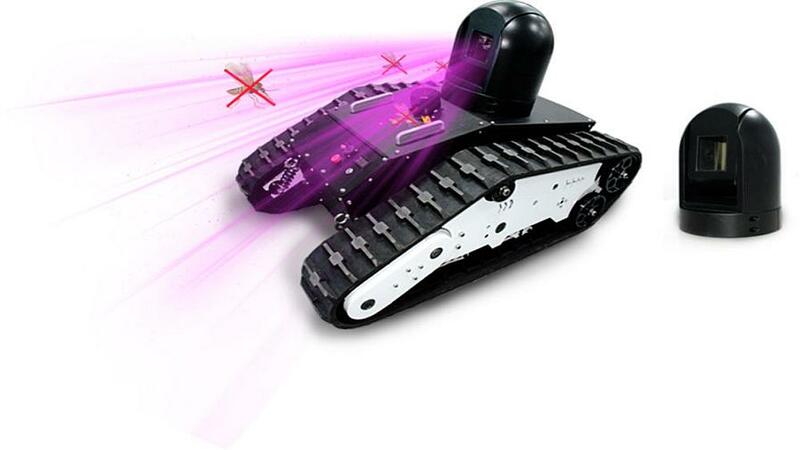 LeiShen Intelligent’s Laser Movable Mosquito Killer Robot. Through an object recognition and tracking algorithm, this tiny tank will seek out mosquitoes and blast them out of the air. I am not sure about you, but I have sprayed for aphids, grasshoppers, and other pests many times in my life. My method has usually been to spray the outside edges of the field, hoping to destroy the hoppers before they move into the middle of the field. Although this is a very effective way to destroy the little buggers, there are three reasons that I am not always a fan of handling chemicals. First, the inhibitors can affect humans in ways herbicides can’t. Also, if you use machinery, you’re going to get some flattened crops, or at the very least unnecessary compaction during the growing season. And finally, chemicals cost a lot of money and cannot be reused once sprayed. I will be excited, as will nearly every farm kid on the planet, to get these little robots out of the shed and declare bug-war! No compaction, no chemicals, infinitely reuseable, no crop destruction, just a 24-7 war on pests! Effective, easy, automatic, and safe. Not to mention fun. I’d like to buy this robot and test it in the Kenyan farm landscape as our farms are heavily affected by arphids. How much is it CIF mombasa.